The Inn Above Tide, The Citizen Hotel, and The Nobu Hotel Epiphany offer guests a bevy of eclectic, in-room choices. Dig into the Fresh Fridge and its plentiful health-focused choices at The Nobu Hotel Epiphany in Palo Alto. 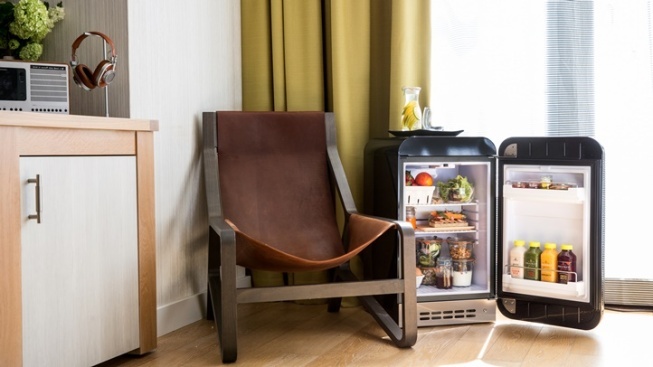 IF YOU HAD THREE GUESSES... as to what might be inside the small refrigerator in located in your next hotel room, would you even take them all? Or would the first guess cover the territory in a correct and succinct fashion? Would you be able to predict the snacks and drinks found within the cold box, almost to the order in which they appear, left to right? We're not mouthing off about such things, as a solid mini bar is a lovely thing, especially if you're looking for a late-night snack or sip without departing the room. But there are those innovative, think-outside-the-mini-bar hotels that are pushing the envelope, or, rather, the refrigerator door, on what exactly might go inside this wondrous rectangle of hotel-yummy delights. Look to a trio of hotels in Palo Alto, Sacramento, and Sausalito for innovative, adult-focused libations, and ponder if you'd like a glass of sake or fine beer upon check-in (after the travel, and the getting there, you just might). The Nobu Hotel Epiphany... of Palo Alto is putting the focus on fresh-o-sity and healthfulness via its Fresh Fridge. Look for "assorted juices and nut milks" inside, including Swiss Beetz and Green Immunity, as well as goodies such as "seasoned in-house, full biotic yogurt with goji berry and blueberry crumble." The fridge? It's a "mid-century modern" SMEG. The price to have this special mini-bar added to your room? It's $95. The Citizen Hotel... of Sacramento is very much about the stellar suds, which makes complete sense, as our capital city is now synonymous with fine craft brews. Eager to see that reflected in the refrigerator in your hotel room? Request the Fill Your Fridge for $65 and find a caboodle of curated foam-fabulous libations from spots like the Device Brewing Company and Hemly Cider. There'll be eight beers and/or ciders in all. The Inn Above Tide... in Sausalito has partnered with Sushi Ran to create a Sake Mini Bar. The local eatery's own Chef Yoshi Tome is overseeing the seven sake bottles stocked within the refrigerator, bottles that include Organic Junmai Nama and Nigori Silky Mild Unfiltered Sake. The NutriChef refrigerator holding the delicious drinks also includes senbai, the palate-pleasing Japanese rice crackers.